448 Beacon is located on the NW corner of Beacon and Hereford, with 428 Beacon, a vacant lot, to the east, across Hereford, 450 Beacon to the west, and 435 Beacon to the south, across Beacon. 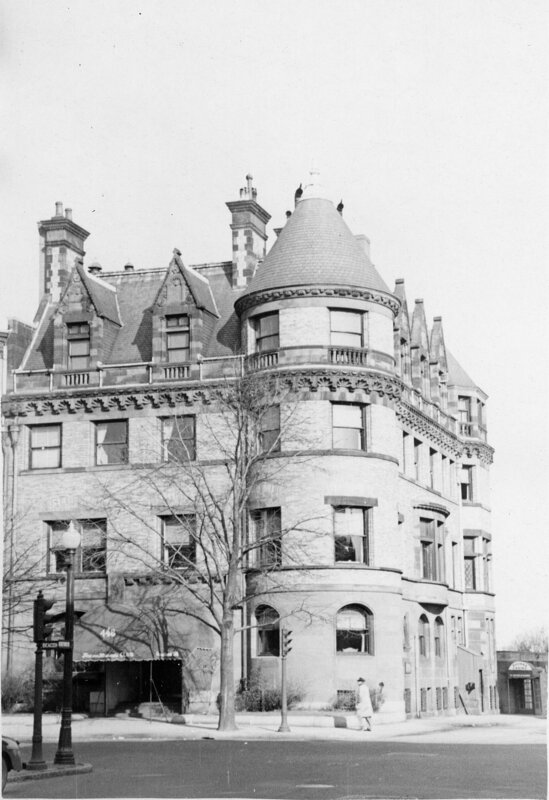 448 Beacon was designed by Andrews and Jaques, architects, and built in 1889-1890 by B. D. Whitcomb & Co., builders, as the home of Robert Chamblet Hooper and his wife, Helen Angier (Ames) Hooper. Helen Hooper’s father, Frederick Lothrop Ames, purchased the land for 448 Beacon on March 1, 1888, from William G. Saltonstall, who had purchased the land from the Boston and Roxbury Mill Corporation on February 10, 1886. Frederick and Rebecca Caroline (Blair) Ames lived at 306 Dartmouth. The original lot had a frontage of 56 feet, and on May 16, 1888, Frederick Ames sold the western one foot to William Simes, who owned the adjoining property. On the same day, they entered into a party wall agreement with respect to any wall that would be built on the boundary between 448 Beacon and 450 Beacon. William Simes combined the one foot strip with his land and, on December 13, 1889, sold Frederick Ames the 26 foot wide lot where 450 Beacon later would be built. Click here for an index to the deeds for 448 Beacon. Although the land was owned by Frederick Ames, Robert Hooper is shown as the owner on the original building permit application for 448 Beacon, dated March 27, 1889, and on the final building inspection report, dated December 20, 1890 (bound with the report, located in the Boston Public Library’s Arts Department, is a faded and water-damaged blueprint of the first floor plan). 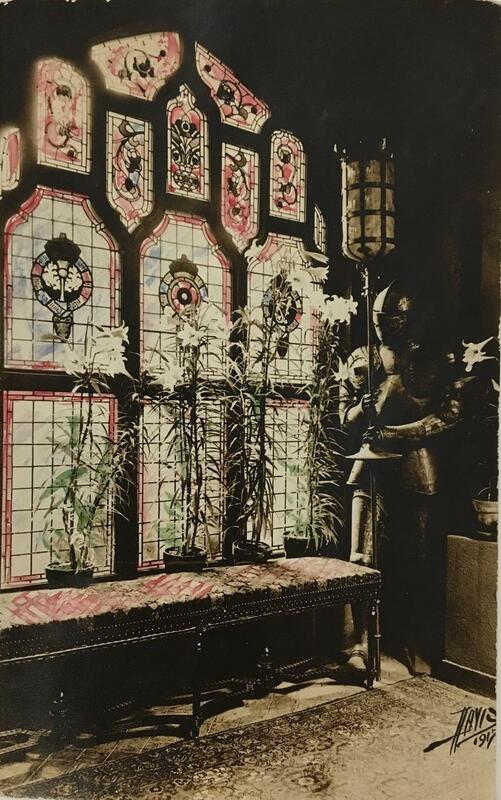 By the 1890-1891 winter season, 448 Beacon had been completed and Robert and Helen Hooper had made it their home. Their only child, Helen, was born there in March of 1891. They had lived at 40 Hereford during the previous season. They also maintained a home in Manchester. Robert Chamblet Hooper was treasurer and later president of the Constitution Wharf Company. A noted dog fancier, he was owner of “Judge” (also known as “Hooper’s Judge”). credited as the ancestor of the Boston Terrier breed. On May 13, 1891, after 448 Beacon was completed, Frederick Ames sold the lot at 450 Beacon to Annie Hardon (Burr) Farlow, the wife of Dr. John Woodford Farlow. They lived at 234 Clarendon. The deed included a provision, intended to preserve the view from 448 Beacon, specifying that no building could be built on the property at 450 Beacon any further north than a line 100 feet 8 inches north of Beacon (other than the usual outbuildings, including stables, the height of which could be no more than 15 feet). The deed also provided that, if the building at 448 Beacon was extended further north, then the building at 450 Beacon could be extended up to an equivalent amount. Frederick Ames died in September of 1893, and on December 27, 1893, Helen (Ames) Hooper purchased 448 Beacon from his estate. Helen Hooper died in February of 1907, and Robert Hooper died in August of 1908. Their daughter, Helen, continued to live at 448 Beacon. By 1910, she had been joined by a companion, Susan Blake (Hall) Horton, the widow of Nathaniel (Nathan) G. Horton. She previously had lived in Milton. The original land transfer deeds from the Boston and Roxbury Mill Corporation included restrictions with respect to the nature and dimensions of buildings that could be erected on the land. The deeds for the land at 448-458 Beacon did not include any restrictions limiting what could be built at the rear of the property, but the deeds for the remainder of the block did, specifying that “no buildings other than the usual outbuildings including stables of not more than one story in height shall before January 1, 1910, be erected on said parcel northerly of a line parallel with and ninety feet north from the northerly line of Beacon Street.” On August 2, 1909, all of the owners of the property on the north side of Beacon between Hereford and Massachusetts Avenue (other than the Mt. Vernon Church) entered into an agreement to “continue for twenty years longer [to December 31, 1929] the existing freedom from irregular building and obstruction of view which they now enjoy from the rear portion of their houses.” The owners of 448-458 Beacon joined in that agreement, accepting the same rear yard limitation on their property as applied to the properties further west, with the provisos that existing structures that did not comply did not need to be modified and that the agreement did not “affect or impair” any existing agreement between the property owners. Helen Hooper married in April of 1911 to Lathrop Brown; after their marriage, they lived in New York City. Lathrop Brown was a real estate dealer in New York and was elected to Congress in 1913, serving one term. He had been Franklin Delano Roosevelt’s best man at his wedding to Eleanor Roosevelt in 1905. Susan Horton probably moved from 448 Beacon after Helen Hooper’s marriage. By the 1913-1914 winter season, she was living at 315 Dartmouth as a companion to T. Jefferson Coolidge. 448 Beacon was not listed in the 1912 and 1913 Blue Books. On September 20, 1912, 448 Beacon was acquired from Helen (Hooper) Brown by real estate dealer William P. Natale. The property subsequently changed hands and on May 2, 1913, it was purchased by Mabel De Carteret (Hunt) Slater, the widow of textile mill owner Horatio Nelson Slater. She also maintained a home, The Knolls, in Webster, where the Slater Mills were located, in Bar Harbor, and in the Readville district of Milton, at Pine Bank. 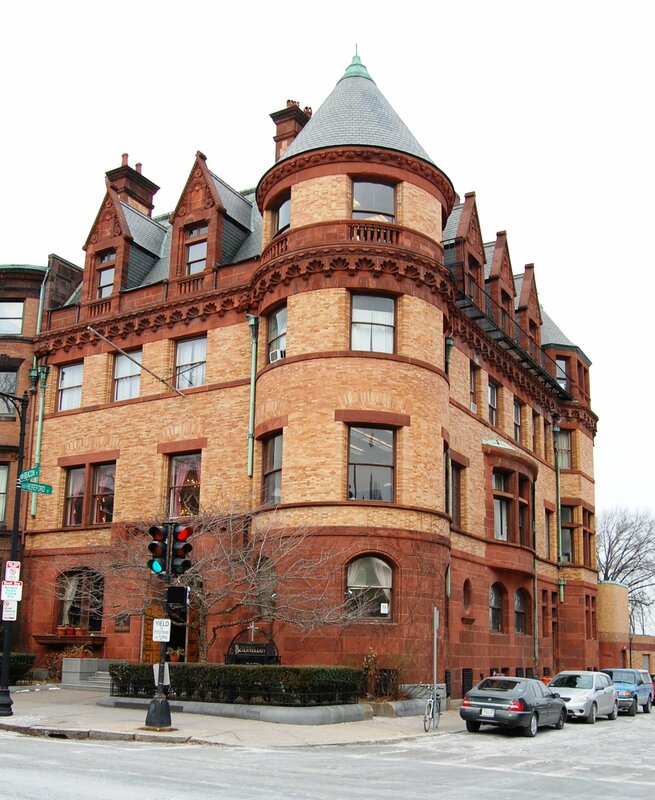 Prior to Horatio Slater’s death in August of 1899, they had maintained their Boston residence at 17 Gloucester. Their four children – Esther Slater, Horatio Nelson Slater, Ray Slater, and William Morris Hunt Slater – lived with her. Between about 1904 and 1912, she had engaged in a prolonged and ultimately successful legal effort to prevent the sale of the Slater Mills in Webster by the trustees of her husband’s estate, seeking to preserve them under family control for the benefit of her children. She appears not to have maintained a home in Boston during this period. Mabel Slater was the daughter of noted artist William Morris Hunt. She was an inventor, filing various patents with the proceeds to go to charity. In 1904, she patented a method of obtaining ice-cooled water from a spigot installed into an ice-box refrigerator, and in 1914, a gauge to show how much ice was left without having to open the ice-box. She also invented a sleeping bag that doubled as a garment, said to have been used in World War I. 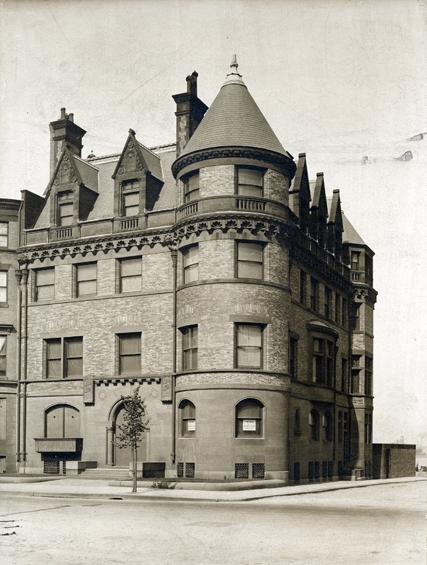 In July of 1913, she applied for (and subsequently received) permission to construct a ballroom addition at the rear of 448 Beacon, designed by architects Bigelow and Wadsworth. Plans for the addition are included in the City of Boston Blueprints Collection in the Boston Public Library’s Arts Department (reference BIN L-22). The rear addition for the ballroom would appear to have conflicted with the 1909 agreement prohibiting new rear yard construction. However, either no neighbor objected or it was concluded that the addition was permitted by the language referring to possible future extension of 448 Beacon included in Frederick Ames’s 1891 agreement with Annie Farlow when he sold her the land at 450 Beacon. On December 9, 1913, Mabel Slater bought the vacant lot at 428 Beacon on the northeast corner of Beacon and Hereford, across Hereford from 448 Beacon. She sold it three years later, on October 23, 1916, to Marie (Griffin) Dennett. wife of Carl Pullen Dennett. According to an October 29, 1916, “Table Gossip” item in the Boston Globe, she “purchased it with the intention of developing it into an Italian garden” that “might enhance the attractiveness of her residence,” but “never carried out her idea.” The Dennetts lived at 250 Beacon and also never developed the lot. In April of 1915, Esther Slater married Benjamin Sumner Welles, who had graduated from Harvard in 1914. Esther Slater’s brother, Nelson, was his best man, with whom he had traveled to Africa in 1914 on a big game expedition. Nelson Slater sent back lions, monkeys, a baboon, and a bear as donations to the Franklin Park zoo. Sumner Welles joined the US diplomatic service and, after his marriage to Esther Slater, they lived in Tokyo and then at various other locations where he was posted. They divorced in 1923. He later became a foreign policy advisor to Franklin Delano Roosevelt and served as Under Secretary of State from 1937 to 1943. In January of 1916, William Morris Hunt Slater died of pneumonia while attending St. Paul’s School in Concord, New Hampshire. In his memory, in December of 1916, Mabel Slater donated her home in Webster for use by a newly-formed boys and girls club. In 1916, Nelson Slater joined the American Field Service as an ambulance driver in France. He subsequently enlisted in the Naval Reserve, and then served as a flight instructor and test pilot for the Navy, serving until December of 1918. He returned to Boston and lived at 448 Beacon with his mother and his sister, Ray. On November 10, 1917, an intruder entered 448 Beacon through a rear door on Back Street which, according to a November 11, 1917, Boston Globe article, was “always left open under strict orders from Mrs. Slater, in order that destitute and hungry persons may find their way to the kitchen for food.” He went searching for Mrs. Slater, and shot and killed Mrs. Slater’s butler, Emil Knab, who had sought to stop him. He subsequently fled and was caught by the police. Mabel Slater and her unmarried children continued to live at 448 Beacon during the 1918-1919 winter season, but moved thereafter to New York City. She continued to maintain her homes in Readville and Bar Harbor. Ray Slater married in April of 1919 to Dr. James B. Murphy, a physician and pathologist, and H. Nelson Slater married in December of 1921 to Martha Byers Lyon. During the 1919-1920 winter season, 448 Beacon was the home of Grant Walker and his wife, Mabel (Shaw) Walker. They previously had lived at 330 Beacon. Grant Walker was an investor in and director of various textile mills and related businesses. He died in April of 1920. After his death, Mabel Walker moved back to 330 Beacon. 448 Beacon was not listed in the 1921 Blue Book. On August 24, 1921, 448 Beacon was purchased from Mabel Slater by the Boston Masonic Club. It had been formed in September of 1919 and had leased 200 Commonwealth as its clubhouse in 1920. On September 10, 1921, about 1,500 members met at 200 Commonwealth and marched in a parade to 448 Beacon for the informal opening of new clubhouse. On May 1, 1924, the Boston Masonic Club changed its name to the Square and Compass Club. The Club converted the former ballroom into an auditorium, and in June of 1924, it applied for permission to use the roof as an area to serve “light refreshments” at 28 tables with 4 persons per table. According to a July 19, 1924, Boston Globe article, several abutters brought suit to stop the project, arguing that it violated the 1909 agreement designed to protect their unobstructed view of the Charles River Embankment. The suit either was unsuccessful or was settled, and the roof addition was constructed by October of 1924. On October 1, 1930, the Square and Compass Club issued mortgage bonds to finance its operations. On December 11, 1933, the trustees under the bond indenture foreclosed on the mortgage and took possession of the property for the benefit of the bond holders. In December of 1934, the trustees applied for (and subsequently received) permission to convert the property from a club to a club with the privilege of serving alcoholic beverages to members. The application appears to have been made in anticipation of the sale of the property. On January 12, 1935, 448 Beacon was purchased from the trustees by 448 Beacon Street, Inc., which operated it as the Fox and Hounds Club, a private dining club. The Club was initially operated by James R.McManus. By 1939, however, it was owned by Edward I. Davis. He and his wife, Anna R. (Bravman) Davis, lived in Mattapan and later in Newton. In August of 1939, 448 Beacon Street, Inc., applied for (and subsequently received) permission to construct an addition 13 feet x 19 feet x 9 feet high to the “banquet hall” (probably Mrs. Slater’s ballroom, which the Square and Compass Club had converted into an auditorium). In October of 1943, 448 Beacon Street, Inc., applied for permission to convert the property from a private club into a public restaurant. The application was denied and, although the applicant’s appeal was granted by the Board of Appeal, the permit was abandoned, probably because of concerns about egress and other fire safety issues. In December of 1945, Edward Davis’s wife, Anna (Bravman) Davis, acquired the empty lot at 428 Beacon. It probably was used for parking for the Club. During the mid-1940s, the Club added fire escapes and other improvements, and in October of 1948, 448 Beacon Street, Inc., again applied for permission to convert the property into a restaurant that would occupy three floors and the basement. This time when the application was denied, the Board of Appeal dismissed the applicant’s appeal. On April 11, 1949, 448 Beacon was purchased from 448 Beacon Street, Inc. (Edward I. Davis, treasurer) by George Irwin Rohrbough and his wife, Martha Fraser (Waugh) Rohrbough. He was president of Chandler School for Women, a secretarial school, and purchased 448 Beacon for use as a school building. Chandler School previously had been located at 245 Marlborough. The Rohrboughs lived in Cambridge. In conjunction with the sale, 448 Beacon Street, Inc., applied for (and subsequently received) permission to convert the property from a club into a school. In August of 1949, George and Martha Rohrbough filed an affidavit with the Building Department assuring that students would not be permitted on the fifth floor of the property, presumably because of limited egress from that floor. During the 1950s and 1960s, George Rohrbough and Chandler School also acquired 452 Beacon, 420–422–424–426 Beacon, and the vacant lot at 428 Beacon. They sold 420-422-424-426 Beacon and the vacant lot at 428 Beacon in August of 1971 to the New England College of Optometry, and retained 448 Beacon and 452 Beacon. On June 15, 1971, the Chandler School purchased 448 Beacon and 452 Beacon from George and Martha Rohrbough. He retired as president of the school in 1972. On June 20, 1975, the Shawmut Community Bank foreclosed its mortgages on 448 Beacon and 452 Beacon and took possession of the properties. On December 19, 1975, 448 Beacon was purchased from the Shawmut Community Bank by the Church of Scientology. In November of 1975, in anticipation of the sale, the bank had applied for (and subsequently received) permission to convert the property from a school into a place of worship. 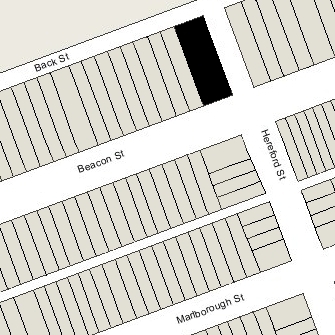 On June 17, 2013, the Church entered into an easement agreement with the New England College of Optometry (owners of the vacant lot at 428 Beacon) with respect to the use of Hereford Street between Beacon and Back Streets (that portion of Hereford being a private way). The agreement specified the exclusive right of the owners of 448 Beacon to park vehicles on the western side of the street and the exclusive right of the owners of 428 Beacon to park vehicles on the eastern side of the street (in the late 19th Century, when it developed its land on the north side of Beacon, the Boston and Roxbury Mill Corporation retained the land between 448 Beacon and 428 Beacon as a privately owned extension of Hereford Street, 40 feet in width; the City of Boston did not designate the extension as a public street and when the Boston and Roxbury Mill Corporation ceased to exist, the property was subject to common law principles regarding abandoned property (codified in 1971 in the derelict fee statute) and the western half of the private way became the property of the owners 448 Beacon and the eastern half became the property of the owners of 428 Beacon). On August 20, 2013, 448 Beacon was purchased from the Church of Scientology by the 448 Beacon LLC. In November of 2013, it applied for (and subsequently received) permission to convert the property from a place of worship into a multi-unit residential building (the number of units not being specified). On July 27, 2016, the 448 Beacon LLC converted the property into six condominium units, The Hooper Mansion Condominium.